The BOD POD estimates lean muscle mass and the percentage of body fat. This egg-shaped pod uses air displacement to measure the body’s density within a 2% margin of error. Cost: $30 for community members; University faculty, staff and students get 50% off. Testing is highly accurate, safe, and quick, with a complete analysis in about 10-minutes. Uses the most advanced technology available today. · Easy and suitable for all types of populations including the obese, disabled, elderly, and children. · Provides excellent repeatability and tracking. · Bod Pod body composition analysis is based on the same whole-body measurement principal as underwater weighing but using patented air displacement technology instead of water. · The subject sits comfortably inside the Bod Pod while computerized pressure sensors determine the amount of air displaced by the person's body. Email totalwellness@txstate.edu to schedule your appointment today! For more information and to schedule, contact Carolyn Clay at 512.245.1972 or totalwellness@txstate.edu. · 3-day diet analysis (nutritional and caloric content) . · Personalized nutritional and physical activity plan, based on sound guidelines, that is both sensible and easy to follow. 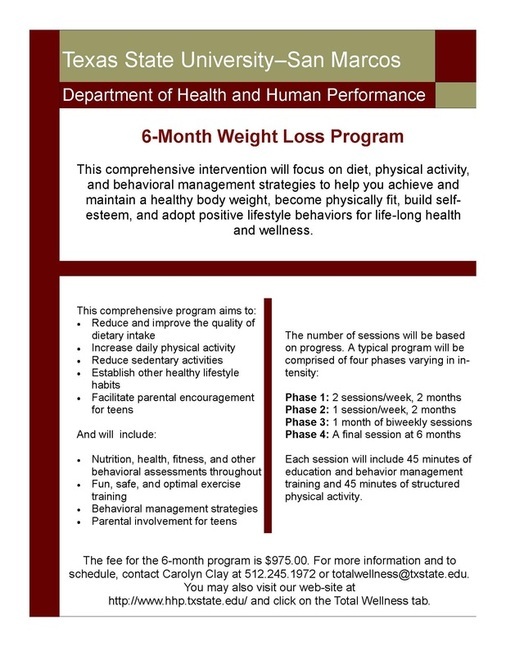 For More Information Please contact Carolyn Clay at totalwellness@txstate.edu.